Before I attended my first NPE (April 1-5; Orlando, FL), I was told (warned) about the size of the show. Since I’ve covered conferences and trade shows in the past, I felt I had an idea of what the show will be like. Exhibitors, interviews, press conferences – been there, done that. Well, it’s true what they say – you do learn something new every day. I learned that NPE is a whole other beast. Yes, there were plenty of interviews and press conferences to give me story ideas for weeks to come, however, I don’t think I truly visualized how many exhibitors would bring machines, and also just a seemingly endless display of machines and exhibitors throughout the show. NPE is not just a big show; it seems to be the granddaddy of them all when it comes to plastic events in North America. With the smell of molten plastic in the air, not unlike the smell of a hardware store (in my opinion), and with the sounds of machines chugging in the background, I saw robotic arms dribble and shoot basketballs, machines spouting out plastic pellets, and much more. 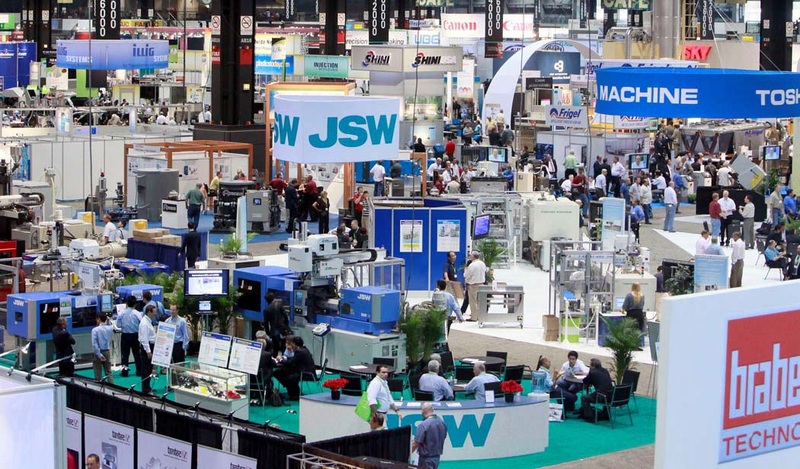 After all, according to SPI, more than 1,900 companies had displays, which covered 920,000 sq-ft exhibit space, or 20% more than the total three years ago. NPE’s move to Orlando was a hot topic throughout the week, and most of the attendees and exhibitors I spoke with said they were happy with the move. They were pleased with the venue, and liked Orlando. Some did mention that people seemed to have an earlier start at NPE in Orlando than they did in Chicago, which meant that people also left earlier in the day. Whether that was due to trying to fit in family vacation with NPE is up for debate. NPE was not for the weak, practically when it came to walking. The two OCCC buildings were about a 15 to 20 minute walk, 10 minutes if you were a reporter running to make your next meeting on time. Some people seemed unhappy about the distance between the two buildings. In response, attendees were given a blue walking cane to aid their journey. Personally, I enjoyed walking between the two buildings because it was nice to get some exercise as reporters are usually chained to their desks on an average day. Also, I would love to give a shout out to the pressroom on the third floor that supplied an endless amount of coffee and food. For NPE2015, please continue to supply the media with coffee and food as it does give us fuel. Thanks. I ran out of business cards on day three. I didn’t think it was possible I could actually run out of cards but there were just so many people to meet, which of course is a great “problem” to have. Next time, I’m bringing my entire stack of cards. Back to the machines and materials. It was fantastic to meet reps from companies in person and get to know what new products they are unveiling or have in store. For example, prior to NPE, I’ve talked with several German companies via email, and it was great to talk in person, and I’m glad NPE gave me that opportunity. In a nutshell, as a first-timer at NPE, it left me exhausted, as if a tidal wave of information hit me, but at the same time, excited about the plastics industry, and new technologies that are driving it forward. As I mentioned above, I came away with NPE with plenty of news, feature articles, and trend stories and I’m excited to share those with our audience throughout the week.